New with tags please refer to pictures. Machine washable. Want to know more?. Created for Macy's. Wrinkle Resistant. Alfani Split Neck Tee. Color: Navy Blue. Machine Washable. Short Sleeves. Style Number: 16620TEE. Size: Large. Inventory Location: Box 51 - 726895223231. 3 nice Alfani shirts. NECK TO HEM. FRONT 21 1/2 - 25" BACK 25 1/4 - 26 1/4". Very good. Burgundy shirt has loose threads bottom of inside seam - easy fix. 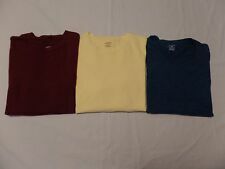 Blue 60/40% Cotton/Polyester, Yellow & Burgundy 100% Cotton. Material: 100% Combed Cotton. Sleeve Length: Short. Fit: Regular. FRONT 24 1/2" BACK 28". Very good, no visible stains, tears or holes. 100% Cotton. ARMPIT TO ARMPIT. Brunei Darussalam. COUNTRY OF ORIGIN. (Short Sleeve, Crew Neck, Striped Casual Shirt. Across Chest ): 23". Top of Shoulder to Cuff ): 9.5". of Collar to Hem ): 29”. Blue – See Photos. Length(Bottom. We are only human and may make a mistake once in a while. Machine washable. Created for Macy's. 1 short sleeve crew neck T-shirt. Color: green. Size: large. Color - Bright White. Size - Large - ( Chest 46" ). Machine washable. Pre Owned in good condition. Photos are actual item, photos colors may vary slightly but are taken under the best possible lighting available. We are doing more, for those with less. By purchasing goods through us, you are directly impacting a life in a positive way. A portion of every item we receive goes directly to those who are less fortunate than we are. Color: Matte rose. - Style: Short sleeve, V-neck, Stretch. - Size: Large. 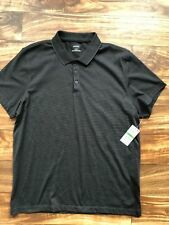 Men's Alfani Casual Button Down Collared Shirt. It is Navy Blue, size Large, 100% Cotton & in Excellent Condition. See pics for measurements. Size Type: Regular Sleeve Length: Short Sleeve Style: V Neck Material: Rayon. 100% Authentic Alfani. U:726895171686|Style:17607TEE|Rep:|schart:yes|Minutes:1|Am:create. Style: V Neck. Size Type: Regular. Sleeve Length: Short Sleeve. Inventory Number:5905-0304. We get great deals from them that we pass on to you! 100% Authentic Alfani. Style: V Neck. Size Type: Regular. 40% Polyester. 60% Cotton. Sleeve Length: Short Sleeve. U:726895904925|Style:100016681|Rep:|schart:yes|Minutes:1|Am:create. Inventory Number:5941-0165. 100% Authentic Alfani. Style: V Neck. Size Type: Regular. Sleeve Length: Short Sleeve. U:726895917239|Style:16649ATEE|Rep:|schart:yes|Minutes:|Am:create. Inventory Number:6111-0005. We get great deals from them that we pass on to you! 100% Authentic Alfani. U:726895171747|Style:17607TEE|Rep:|schart:yes|Minutes:0|Am:create. Material: Rayon |. Material: Rayon. Style: V Neck. 45% polyester. Size Type: Regular. Inventory Number:5905-0276. Size Type: Regular Sleeve Length: Short Sleeve Style: Basic Tee Material: Polyester. Size Type: Regular Sleeve Length: Short Sleeve Style: V Neck Material: 100% Polyester. Size Type: Regular Sleeve Length: Short Sleeve Style: Basic Tee Material: Cotton Blends. It is by Alfani, 60% cotton 40% polyester, machine washable, has a crew neckline, short sleeves, no pockets, and is an aqua blue and white heathered color. Advocate Apparel. We are doing more, for those with less. By purchasing goods through us, you are directly impacting a life in a positive way. A portion of every item we receive goes directly to those who are less fortunate than we are. Know what size you wear before you buy! Style: Short sleeve, Crewneck, Stretch. - Color: Deep twilight. - Size: Large. - Material: 60% Cotton 40% Polyester.